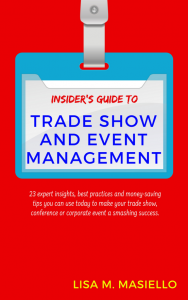 Of the many resources that vendors and their partners can study to drive a higher ROI out of trade show or event participation, the Insider’s Guide to Trade Show and Event Management is an excellent option. The 23 actionable tips it features are grouped into three sections: Pre-Show Tips, On-Site Tips and Post-Show Tips. Masiello opens each chapter with a quick description of the information it contains such as Save Money, Free Opportunity, Save Time or Expert Insight. The 79-page book is an excellent reminder of best practices for experienced event planners. For channel marketers new to planning event participation, or vendors who want to provide their partners with actionable information on how they can drive more ROI from the events at which they exhibit or host, Insider’s Guide to Trade Show and Event Management is a handy resource. The Insider’s Guide to Trade Show and Event Management is available on Amazon.